At the dawn of the 20th century, the beautifully ornamented wood and coal range was the heart of the home, and around it revolved the life of the entire family. These wood and coal fired stoves for cooking and heating have been in use since the 1880's. Wood and coal burning kitchen ranges lost popularity around 1920 when wood and coal gave way to gas because it was cleaner and did not have to be carried and loaded into the stove. Today, wood stoves have regained popularity. A wood cookstove seems to have more charm that a gas stove. Perhaps more importantly, Many people have their own inexpensive supply of wood but not too many people have a gas well out back. 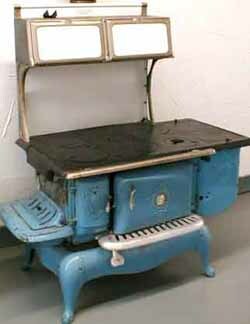 Antique wood cook stoves can be restored to their original elegance and efficiency. 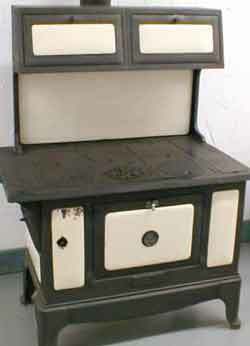 Old stoves can be restored by sandblasting and refinishing. If parts are missing they sometimes can be found, or can be recast. Plated parts can be replated in nickel like the original. New wood cook stoves are also available, built in the style of the older stoves. These beautiful stoves are now being used in country style kitchens as well as cabins and rustic retreats.